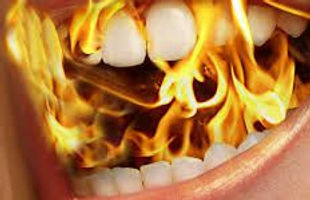 If you have found this blog, you are probably a Burning Mouth Syndrome sufferer or know someone who is. Perhaps you are someone who only suspects you have BMS and what you have read on the Internet so far is scary, disheartening, and often filled with errors and speculation. Let me set your mind at rest about several things…some will still be disheartening, but that is the reality of this under-diagnosed and often baffling chronic pain. Burning Mouth Syndrome will not kill you. It is not fatal in itself, but unless people find coping strategies, medicines, and support, it can be as dangerous as any other chronic pain condition. If you don’t get medical treatment and support, chronic pain can lead to depression and even self-harm. The hallmark of BMS is diffuse burning in the mouth and tongue with no visible symptoms. This means if you have lesions, cracked or geographic tongue, discoloration of the tongue or oral cavity or any other visible symptom…you may be barking up the wrong tree. It is possible to have Burning Mouth Syndrome that is caused by underlying conditions, and you will always do better if you treat those ailments first. Your BMS pain may simply disappear, and wouldn’t that be great? The medicines that are most often used for BMS result from 2002 studies by Dr. Miriam Grushka, et al, and so you may find your doctor or neurologist suggesting that you try Gabapentin (Neurontin) and Clonazepam (Klonopin). Your doctor may also suggest updated versions of these medicines or additional medications. Do these drugs have side effects? Yes, they do, and if you and your medical professionals decide on something you should try, they will guide you in the safe ways to ramp up to the dose and then to ramp down from it if you find it does not help you. Major side effects generally include drowsiness, and so you must follow the dosage schedule and any prohibitions on driving while you are adjusting. Never just stop medicine you have been prescribed without communicating with your doctor. Some medicines can be more dangerous when abruptly withdrawn than when you are taking it. Also, pay attention to the dosage limits and follow your doctor’s instructions. Supplements may help. Many who have BMS also have low levels of B12 and D3 and one of the very first things your doctor should do is to order a blood test that will show these and other levels and whether you should be supplementing, getting additional sun exposure, etc. Some BMS patients swear by Alpha Lipoic Acid and others say it had no effect on their chronic pain. Talk with your doctor to be sure there are no interactions of any supplement with your usual medicines, and if there isn’t, it may be worth a try to see if you are someone who experiences relief. Self-care may help. Acupuncture, Massage, Yoga, any kind of healthy activity can help reduce your stress and believe me, stress is one of our most notable and consistent triggers. Find what works for you and do it as often as you can. You need to keep a pain diary. If you loathe the idea of writing down the details of your pain, I totally understand, even a note in your calendar showing your pain level number or range that day will help. Anything that gives you the opportunity to look for a pattern to your pain, identify triggers and things that help, and assists you in communicating with your doctor or neurologist. There are other articles in this blog about pain diaries and the pain scale if you are interested. The last one, I promise. Talk with your family and friends honestly so they understand that when you withdraw (and on bad days, you will), it is nothing to do with them and everything to do with you. If they ask what they can do to help you, tell them. Whether it is an iced drink when you have a flare of pain or just being able to express how you are feeling; those things help. They will not be able to totally empathize with your pain. It is too outside the realm of what most people have experienced and it would not be fair to expect that. But, if you are clear about your needs, they can be an invaluable support to you. No family? No friends? It may be time for a professional counselor or therapist to express your feelings and fears in a safe and caring space. There is a website with all of the most current studies and abstracts regarding the relatively small amount of research that has been done on this chronic pain syndrome, and perhaps it will be helpful to you and your doctor to check it out. It was created and is maintained by volunteers at their own expense, so if you have seen current scientific studies, articles, abstracts or reports that you don’t find there…please alert the Webmaster and it will be reviewed and may be added! You can be of assistance to fellow BMS sufferers around the world through the BMS Support Website and some fine day, we may have a cure or quick diagnostic tool to announce and celebrate together!